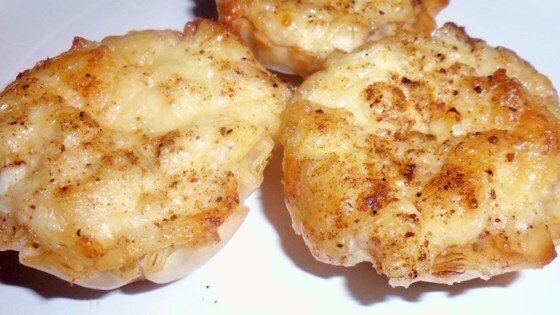 "These shells stuffed with a spicy, cheesy seafood mixture are extremely fast, easy and very tasty." Preheat oven to 400 degrees F (200 degrees C). Lightly grease a medium baking sheet. In a medium bowl, mix together mayonnaise, Parmesan cheese, Swiss cheese, onion, Worcestershire sauce and hot pepper sauce. Gently stir in shrimp and crabmeat. Form phyllo dough into shells. Fill shells with the mixture. Arrange stuffed shells on baking sheet. Bake in the preheated oven 7 to 10 minutes, or until lightly browned. Sprinkle with paprika before serving. See how to make a supreme appetizer! Not a big hit at my party. They taste better when they are hot, but they are hard to keep hot. And I just didn't think they tasted all that special.